In an Oct. 24 online press conference broadcast from the American Astronomical Society (AAS) Division for Planetary Sciences (DPS) 50th Annual Meeting in Knoxville, Tennessee, four members of NASA’s New Horizons team presented a preview of the spacecraft’s Jan. 1, 2019, flyby of Kuiper Belt Object (KBO) Ultima Thule, now just 10 weeks away. The presenting speakers included principal investigator Alan Stern of the Southwest Research Institute (SwRI), science team collaborator Carey Lisse of the Johns Hopkins University Applied Physics Laboratory (JHUAPL), project scientist Hal Weaver, also of JHUAPL, and co-investigator Kelsi Singer, also of SwRI. 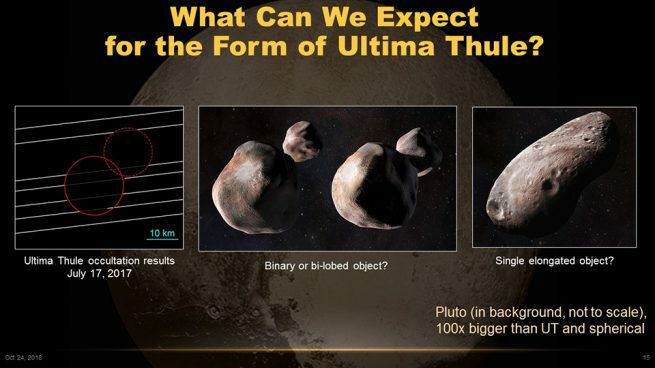 Stern said this flyby will be more challenging than New Horizons’ Pluto flyby in July 2015 because Ultima Thule is located a billion miles beyond Pluto and much about it remains unknown. Mission scientists are still uncertain about its exact position and the presence of any potentially hazardous rings or moons. The spacecraft is older than it was at Pluto and has less battery power now while light levels are lower at such a great distance from the Sun. Additionally, communication between Earth and the spacecraft takes six hours one way, as opposed to four-and-a-half hours to Pluto. “New Horizons is going to have the capacity, in the space of one week, the first week of January 2019, to confirm or refute the very models [of solar system formation] presented here at the Division of Planetary Sciences meeting,” Stern said. Ultima Thule is estimated to be about 23 miles (37 kilometers) wide, much smaller than Pluto, which has a diameter of 1,477 miles (2,377 kilometers). For this reason, pre-flyby images 10 weeks before closest approach reveal just a dot rather than the increasing level of detail seen on Pluto during the same time frame. Details on the KBO will not be resolved until about one day before closest approach, Stern said. In addition to being the most distant object ever explored by a spacecraft, Ultima Thule, which is about ten times as wide and 1,000 times as massive as Comet 67P/Churyumov-Gerasimenko, which was orbited by the Rosetta spacecraft, is set to be the most primitive object studied by a spacecraft. To preview what the KBO’s surface might look like, Lisse presented images of Comet Wild 2, Saturn’s moon Phoebe, Saturn’s moon Hyperion, and Comet 67P. All seven instruments aboard New Horizons will study Ultima Thule. Between now and the flyby, mission scientists will prepare by monitoring changes in the KBO’s brightness to determine its size, shape, and rotation speed, search for moons and other potential hazards to the spacecraft, and refine navigation if hazards are found, Weaver explained. Diversion from the optimal closest approach of 2,170 miles (3,500 kilometers) can be made as late as Dec. 16 if hazards are discovered. An alternate, safer approach would bring New Horizons within 6,200 miles (10,000 kilometers) of Ultima Thule. Image resolution will be better than that obtained at Pluto because of the closer approach. Possible Shapes of Ultima Thule. Image Credit: NASA/JHUAPL/SwRI. Singer outlined the mission’s goals as mapping the KBO’s geology and morphology and mapping its color and composition. Specifically, scientists will look for craters and grooves and various ices, including ammonia, carbon monoxide, methane, and water ice. They will also determine whether Ultima Thule is a binary or contact binary object or a double-lobed object like Comet 67P. Because KBOs are composed of pristine materials left over from the formation of the solar system, studying Ultima Thule’s ices will give scientists insight into the materials from which Earth and the solar system’s other planets were built. 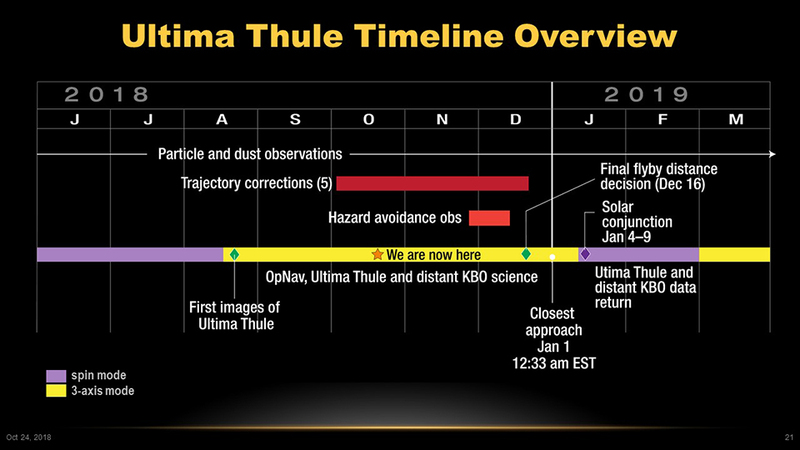 Mission scientists also hope to find answers as to why Ultima Thule, a very dark object, is slightly brighter than expected. They do not expect to find active geology or an atmosphere on such a small object. “This will be our first ground truth, our first close look at what makes these [Kuiper Belt] objects dark and red,” Singer said. 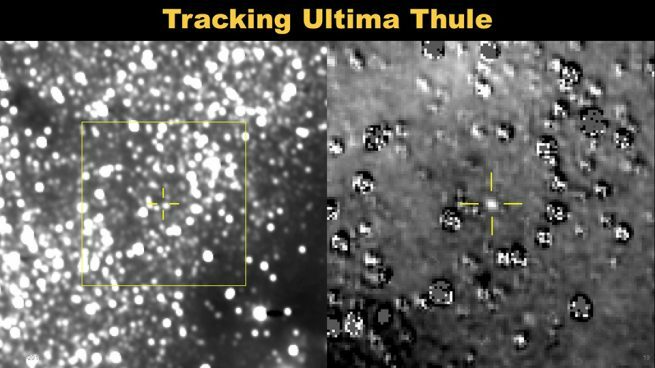 As done at Pluto, New Horizons will return a final image of Ultima Thule just before closest approach, then remain out of contact with Earth, instead focusing on data collection. Between 10 a.m. and 10:30 a.m. EST (15:00-15:30 GMT) Jan. 1, a signal from the probe is expected to arrive, confirming it survived the flyby. 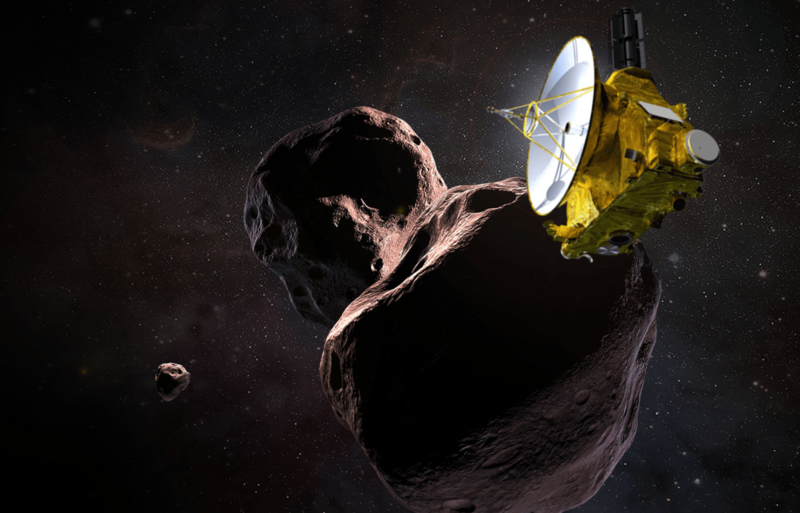 New Horizons will continue to study the KBO and its environment for a short time after closest approach. Return of the data collected will continue through late 2020. Laurel Kornfeld is an amateur astronomer and freelance writer from Highland Park, NJ, who enjoys writing about astronomy and planetary science. She studied journalism at Douglass College, Rutgers University, and earned a Graduate Certificate of Science from Swinburne University’s Astronomy Online program. Her writings have been published online in The Atlantic, Astronomy magazine’s guest blog section, the UK Space Conference, the 2009 IAU General Assembly newspaper, The Space Reporter, and newsletters of various astronomy clubs. She is a member of the Cranford, NJ-based Amateur Astronomers, Inc. Especially interested in the outer solar system, Laurel gave a brief presentation at the 2008 Great Planet Debate held at the Johns Hopkins University Applied Physics Lab in Laurel, MD. SpaceFlight Insiderreports on events taking place within the aerospace industry. With our team of writers and photographers, we provide an “insider’s” view of all aspects of space exploration efforts. We go so far as to take their questions directly to those officials within NASA and other space-related organizations. At SpaceFlight Insider, the “insider” is not anyone on our team, but our readers. Our team has decades of experience covering the space program and we are focused on providing you with the absolute latest on all things space. SpaceFlight Insider is comprised of individuals located in the United States, Europe, South America and Canada. Most of them are volunteers, hard-working space enthusiasts who freely give their time to share the thrill of space exploration with the world.